Autoworkers at a Volkswagen car manufacturing plant in Chattanooga, Tennessee rejected an offer to join the United Autoworkers Union. The UAW is known to negotiate higher wages, better benefits and stronger pension plans for factory workers at autoplants. The other notable feature of the UAW is turning states Blue. Since Democrats support unions and Republicans feel unions represent an incursion on corporate profit, the UAW has, since its inception, kept more socially conservative states in the Democratic voting block. 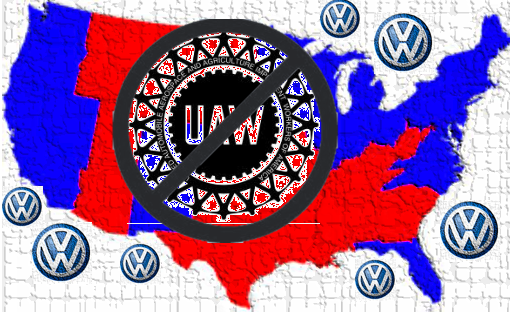 The media reported the rejection of the union by the VW workers a huge defeat to the UAW. The real story is a little different. Republican Senator Bob Corker announced during the VW union vote that he would only allow expansion of the VW plant if the UAW was rejected. This is because Tennessee is a stronghold of Red votes, as are Alabama and Mississippi, the locations of two other foreign car manufacturing plants. If the UAW reached Tennessee, it would likely reach the other two southern car making facilities as well. This could jeopardize Republican dominance of those states both locally and Federally. With Republicans grasping to retain every last red vote to be had, losing one solid red state could result in permanently losing the electoral college, something Mr. Corker dreads.